Generation Citizen was founded because of an idealistic, but deeply grounded, belief in the power of the democratic spirit in which individuals come together to make a collective difference in their communities. GC began in 2008, when its founders Anna Ninan and Scott Warren recognized the extent to which this democratic spirit had been lost in our current political environment, especially amongst young people. In 2008, eight Brown students began teaching action civics in four Providence school classrooms, helping secondary school students realize the power of their voices to make a difference in their communities. In 2015, Generation Citizen celebrated its 5th anniversary as an official non-profit organization. 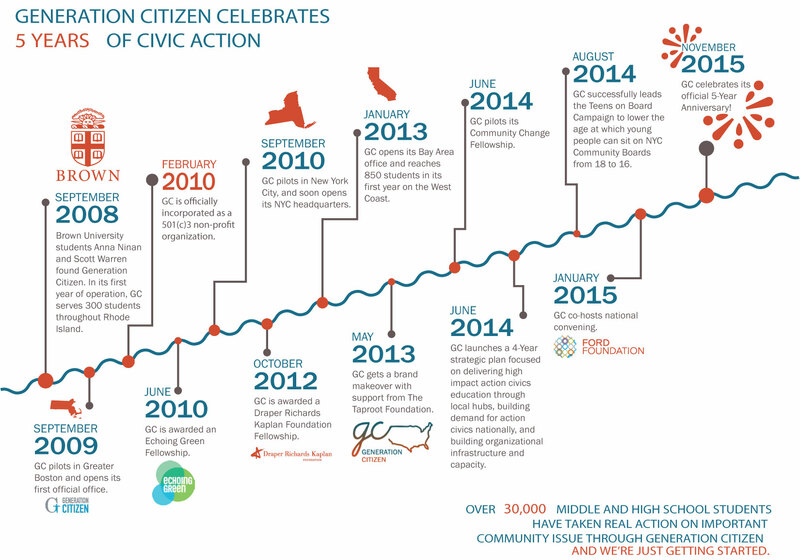 In just a short period of time, over 30,000 students have learned to drive change through action civics.